New member here and as a first post I would like to share my latest completed model. 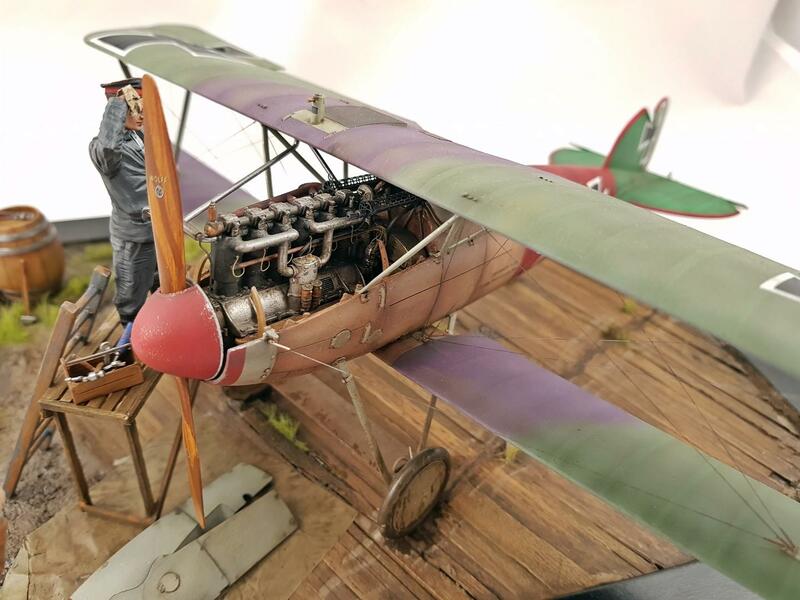 It’s a Wingnut Wings 1/32 kit of the Albatros D.V accompanied by figures from BlackDog. Not much to say about the kit, it is simply great. Built OOB with some minor scratch built engine details. Painted with acrylics. 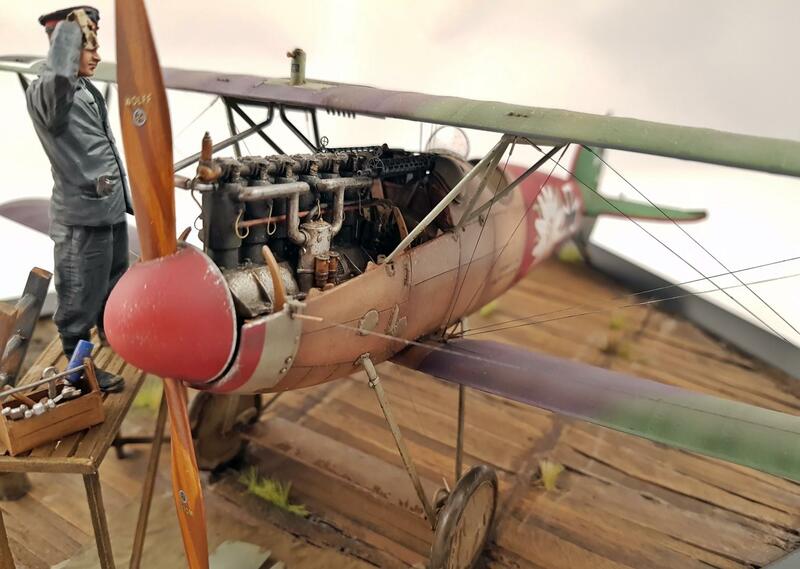 Woodgrain decals and elastic rigging thread from Uschi van der Rosten. Great looking build, can’t go wrong with a Wingnut Wings kit but you have taken it to another level great job. Yeah, their kits are on another level, but a bit on the expensive side. Tell us more about the base, please. The base is a picture frame from IKEA, ground work is made of celuclay and strips of balsa wood. Some accessories are scratch built, some plastic and some PE. It is hard to formulate word to describe how amazed I am with this build! It is perfect in every way and manner…no were else to take this model. Just perfect. Love the camo and color schemes. Love the whole display. 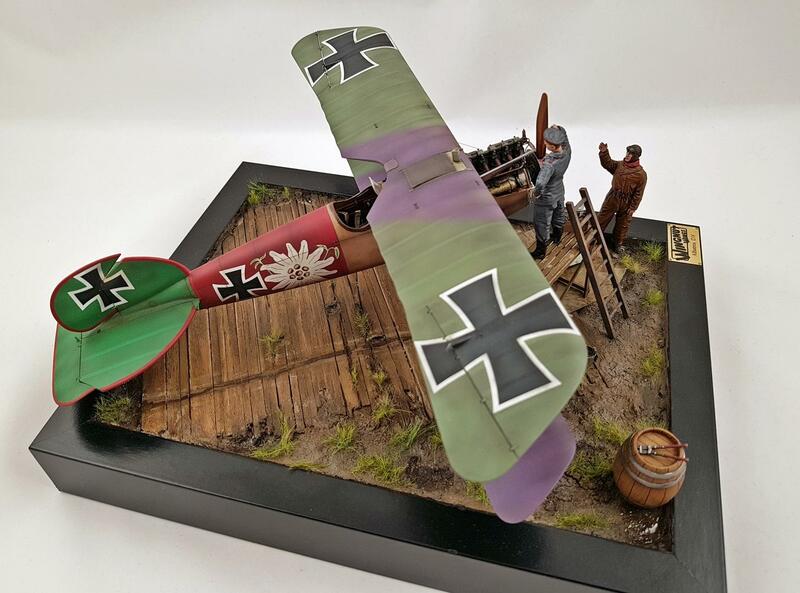 You make take the model of the month for October with this fabulous master piece. I welcome you to this awesome community and I am confident you will raise the overall quality of this forum….WOW! I’m absolutely overwhelmed of your kind words. Happy you liked it! Superb Daniel.Love the camo scheme and the quality of work. Does more than justice to the WnW kit. Congratulations! Stunning workmanship, sir – an all around exemplary build (and welcome aboard). Ah, you people are too nice – it’s not that good. Well, OK, actually, Daniel, it’s better than that – it’s just gorgeous. Even the barrel is a work of art! Has to be the best introduction to this site there’s ever been. Very nice work. A convincing scene, as well. Stacks of 1/32 figures now on the market to meet the WnW ‘effect’ . WoW! Daniel, this is excellent! Welcome to iModeler. Absolutely gorgeous. Wingnut Wings should see this! As everyone else has said, beautiful work. 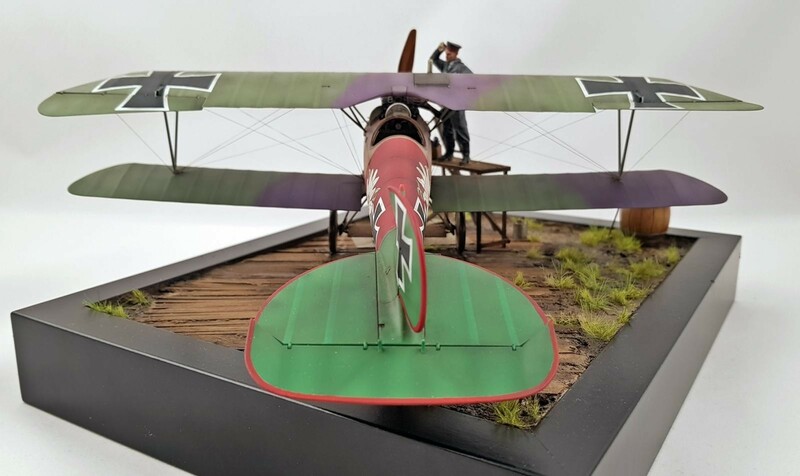 I particularly like that you chose to do the Albatros flown by Paul Baumer of Jasta 5, one of the most interesting German pilots of the Great War. Considered “incredibly decent” by all who knew him, after the war Baumer became the dentist he had originally planned to do before the war, and kept his involvement with aviation, flying in airshows in Germany before finally being killed in 1927 in an accident while doing an aerobatics routine at an air show. Little know was his very close friendship with Erich Maria Remarque, author of “All Quiet On The Western Front,” which was published shortly after Baumer’s death. it’s thought by some literary researchers that Remarque’s choice of the name “Paul Baumer” for his main character was the author’s way of memorializing his friend. 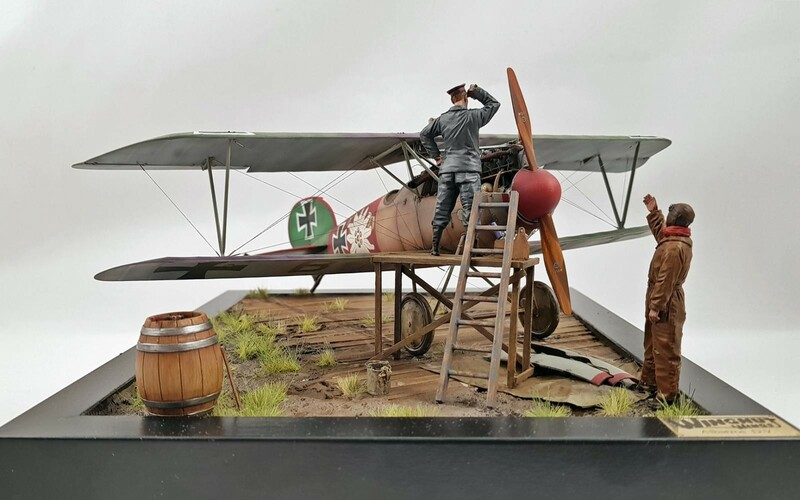 Anyway, really superb work on this model and the entire diorama. 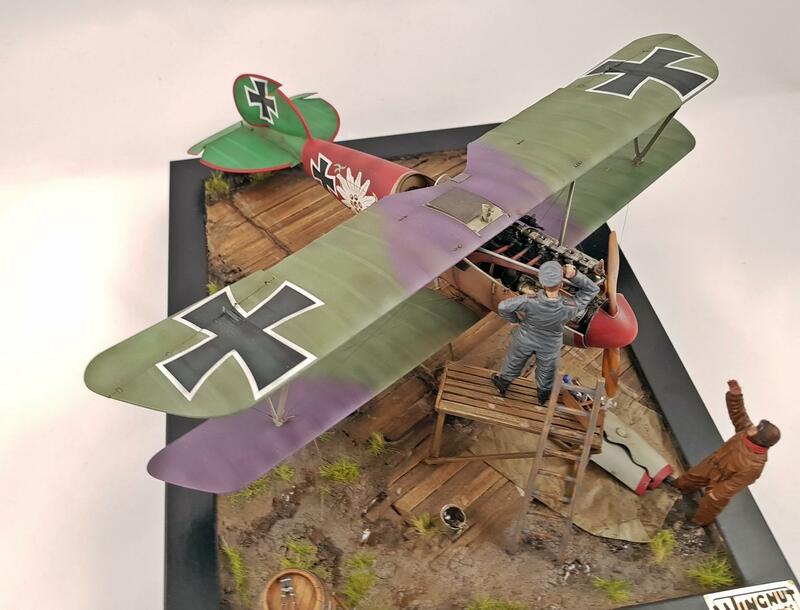 The secret of a great diorama is that every element has to be of equal quality – one cannot be an excellent airplane modeler and merely a passable figure modeler. You’ve got all elements clicking along at top quality here, a really nice, very realistic recreation of a historical moment. Thanks! And thanks for the history, I didn’t know about his friendship with Remarque, very interesting indeed! I’m sure that I had the privilege to see it IRL at the AIM 2018 expo – just awesome! Now that’s down right perty! Outstanding. It’s been said above. I’d just like to add that this is some of the most realistic ‘wood’ I’ve ever seen. Just beautiful! I want to thank you all for all the supportive comments, much appreciated!! Glad you all liked it! Wow, simply wow. And welcome to iModeler. Very very nice. Great taste of time-weathering. 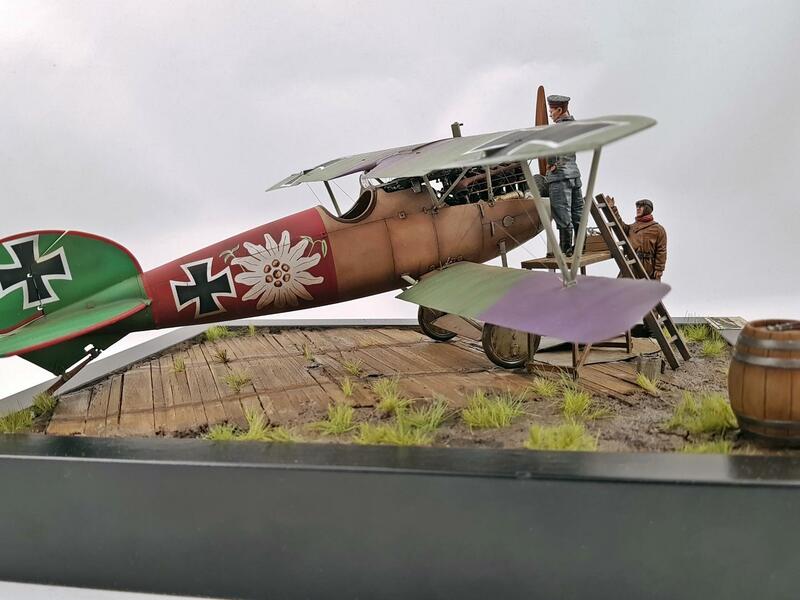 It seems to be in the WW I.
I like the expression of the figures in your diorama; this tell a story to the spectator and help to be immerge in the scene. 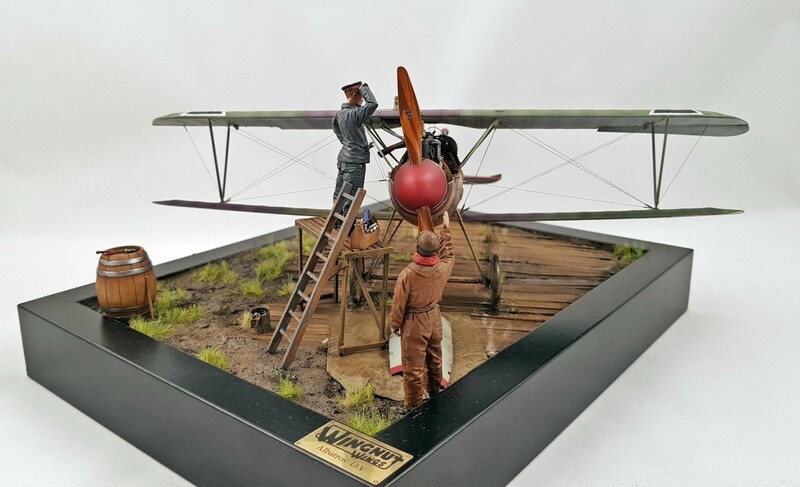 I have also a model from Wingnut, a Roland C.II waiting to be built. Now seeing your model and diorama I am even more impatient to make it. BTW. Some modelers are complaining about the order and delivery process of Uschi products. What about your experience? Been a while since I ordered anything from Uschi, but I had no problems. Great service and about a week delivery time. One heck of an introduction! Excellent in every aspect, and I’m glad you’re on-board the iModeler train! I look forward to more of your work. Just beautiful. Nice little story going on there. Love the colours and how they are balanced to the others. Ser riktigt bra ut det där! That is truly a masterpiece. It looks like a 3 dimensional painting.